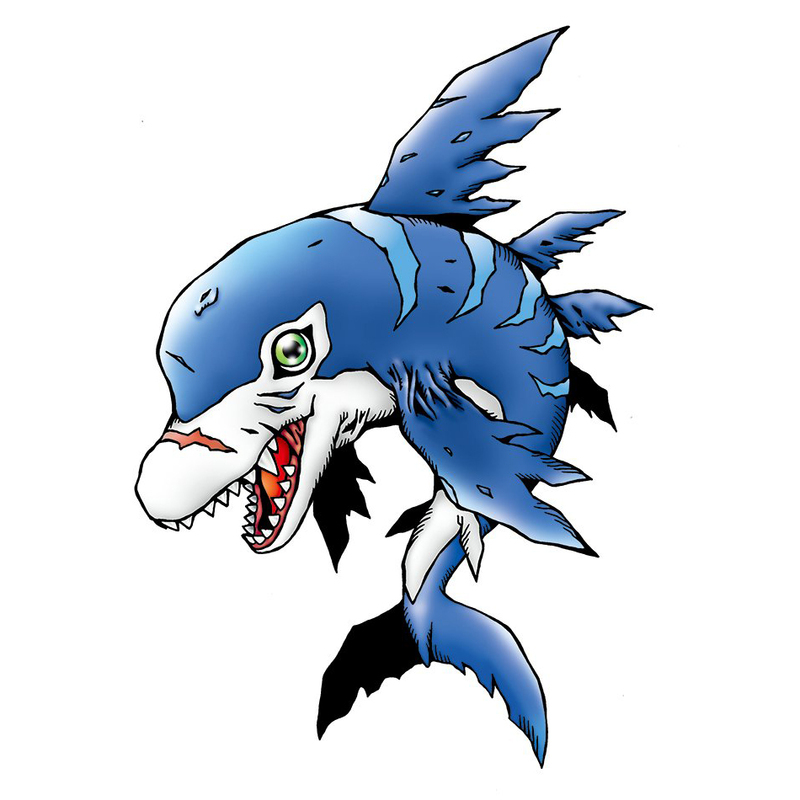 A unique signal that originated within software for researching communication between different kinds of groups changed into a Digimon, as an Aquatic Mammal Digimon with a unique existence. 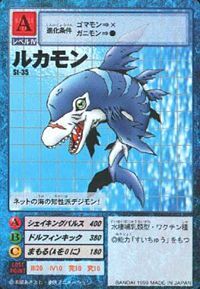 Due to its habitat being limited to the sea, it became able to move about the sea at high speed. As expected from its appearance, it possesses advanced intelligence, but its form of thought is too complex for a normal person to understand. Although it is a species that doesn't like useless battles, It won't go easy against an opponent that comes and challenges it. 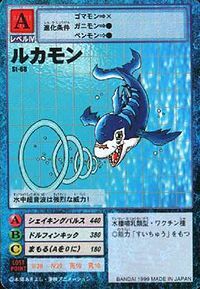 Its Special Move is emitting the ultrasonic waves from its mouth that it uses to communicate, just at maximum power (Shaking Pulse). n., From iruka 「海豚（イルカ）」 meaning "dolphin". Anime/Manga Digimon Adventure 02: "Assault on Black War Greymon"
Shaking Pulse  シェイキングパルス Sheikingu Parusu Shoots a powerful sound wave from mouth. Dolphin Kick  ドルフィンキック Dorufin Kikku Flips into the air and smacks opponent with tail. 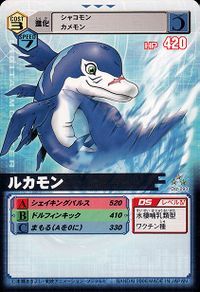 Bon Voyage  ボン・ヴォヤージュ Bon Voyāju Kicks up a wave of water with tail that washes over the foe. A group of Rukamon were recruited by Mega Seadramon to help the Chosen Children protect an underwater Holy Point from Black War Greymon. They combined their attacks with the attacks of Mega Seadramon and blasted Black War Greymon out of the ocean. However, Black War Greymon retaliated by forcing the water to open allowing him to reach it with out going underwater. A Rukamon is pictured as one of the Digimon killed by Kurata Akihiro's forces. Some Rukamon were seen swimming alongside the pleasure cruise at Digimon Land. 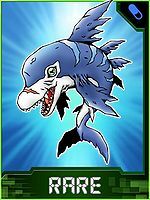 Rukamon evolves from Penmon (3+ DP) and evolves into Whamon Perfect (0+ DP). Rukamon is an enemy digimon. It can be encountered while swimming underwater with Submarimon. 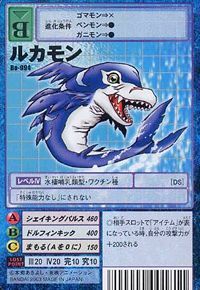 Can be evolved from Betamon if above level 17, spirit 100, and Water EXP 500, or can be found at Macro Ocean. Can evolve to Whamon if above level 32 and Water EXP 6000, or Hangyomon if above level 36, Machine EXP 2900, and already befriended Hangyomon. Rukamon is available as a Digimon Medal. Evolves from Gomamon or Ganimon. Can evolve to Zudomon or be Jogressed with a compatible Digimon to get Whamon Perfect or Anomalocarimon. Evolves from Gomamon or Ganimon. Can evolve to Zudomon or be Jogressed with a compatible Digimon to get Whamon Perfect or Hangyomon. 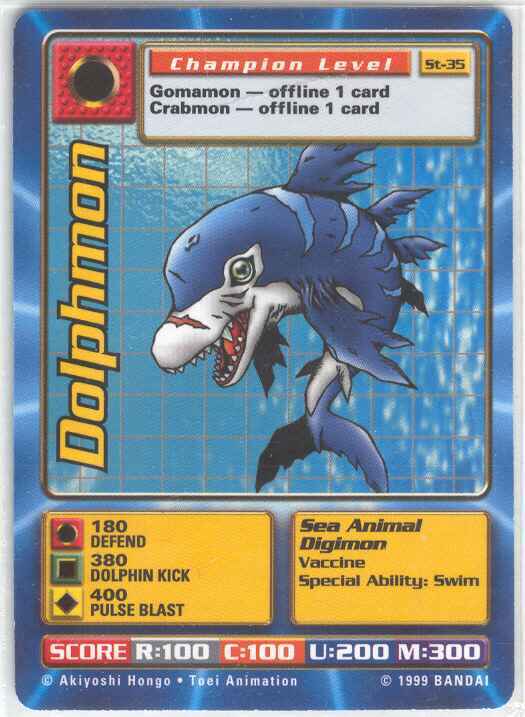 An intelligent Digimon of the Net Ocean! It releases powerful supersonic waves underwater! This page was last modified on 12 April 2019, at 21:11.